From the recent OCSEF competition, one of our students, Charis Pan, got a special award from Engle lab for her project on sugar substitutes. This award is given to individuals who showed persistence and dedication to their research. 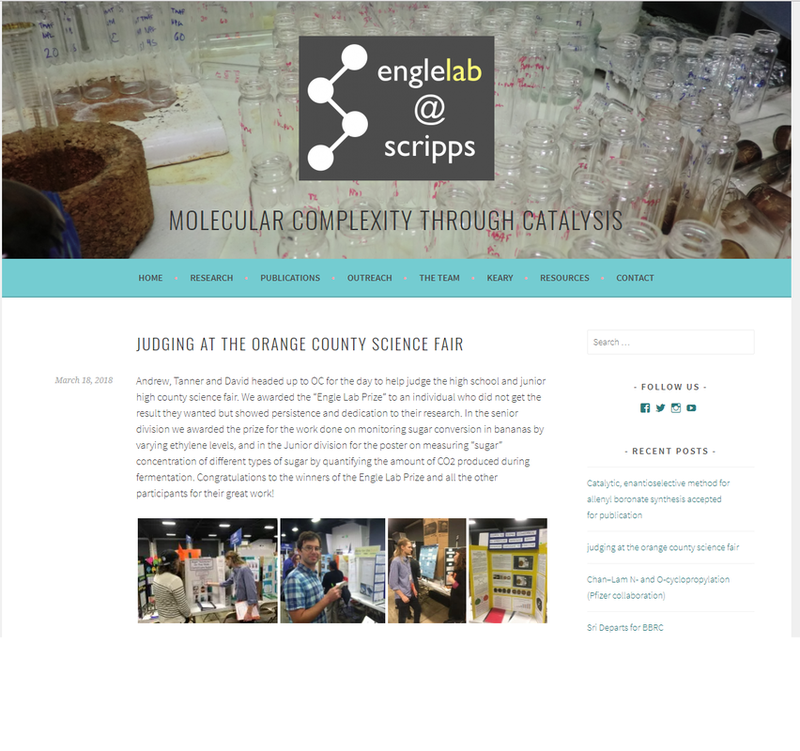 You can check it out from: https://englelab.com/2018/03/18/judging-at-the-orange-county-science-fair/. Congratulation to all the 5th, 6th, 7th, 8th graders and 3 high schoolers of Acaciawood School for finishing Science Fair successfully. Congratulations also to all the winners. You have to be diligent and consistent in updating your journal. Make it as neat as possible. 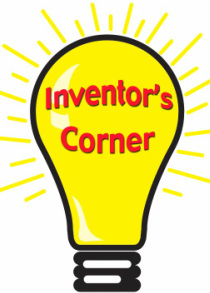 How to Invent or Design...Anything! Not all projects use the scientific method. I am posting here a very good article regarding science fair preparation. I hope you will start reading this and get as many tips and help from this article. Try to visit as many websites about science fair projects as possible. Are you interested in advance projects for science fair? projects that can win top high school competitions like the Intel International Science and Engineering fair (ISEF)? An important factor in selecting a topic is to find one in which the student has sufficient interest to sustain the project from beginning to end. Some science fair projects continue from one year to the next, some are completed in several months, and some can be completed in a few weeks. In general the older the student the more time and effort should be invested in the project. Real world issues with local significance are good topics. Ideas for such topics may be found in newspaper articles, from radio or television programs, in books, or through conversations. Asking a question which has not yet been answered or which has immediacy for the student will attract the interest of the judges and creativity can be shown in developing an experiment to try to answer the question! The topic should be broad enough to allow in depth study but narrow enough that it can be researched and investigated in the time available. Costs should be considered, as should the amount of support from other people which will be needed for transportation and research. Students are expected to show increasing sophistication and application as grade level increases. Elementary students might illustrate or model a science topic of interest to them, or they might demonstrate how a particular principle works. Middle school students are expected to conduct an experiment of some type, and to use process skills which are relational by nature. The student would relate concrete ideas to abstract ones, and would use inductive and deductive reasoning. The student might start by identifying a problem, proposing a possible solution (an hypothesis), then conduct an experiment, record the results, and use the results to draw a conclusion. A high school student would need to show increased synthesis and more theoretical rationalization. Their experiments would need to demonstrate the application of knowledge, technical skills, and experience to the experiment, with strict control of variables and extended analysis of results. Science fair projects are by nature independent studies, and should provide opportunities for the students to challenge but not overwhelm themselves. Care needs to be taken in the selection of the topic, to ensure the best fit between the challenge of the project and the motivation, skills, and interests of the student. The organizations which sponsor science fair competitions have rules and policies which govern the competition; be sure to follow all the rules carefully. Rules governing safety, what you put on display, and proper care for animals are especially important. Some organizations sponsor prizes for projects in certain categories; research these to help in the decision of topic if you wish to participate in the special competitions. Science Fair time can be an exciting period of days, weeks, or even months in which students make new discoveries about the world around them, and about themselves. Any science teacher making an assignment for students to participate in Science Fair has a schedule for the project, and ideas about what kinds of projects students should do. For example an elementary school student might do a demonstration or a model, a middle school students might do a research project or a simple experiment. High school students are expected to do a more complex experiment in an area of scientific inquiry which is of special interest to them. Science fair investigations require time management skills. Students must budget their time, space out the work in manageable chunks, keep to a schedule, and complete their experiment early enough to have ample time for making conclusions and retesting results if necessary for confirmation and confidence. Long term benefits of science fair projects have been identified as well. Students find projects which relate to their everyday lives. Is this project truly original, or has it been done before? Is the answer to my question already known? Will my investigation add significantly to what is known about the topic? Are there outside resources available to me? Have I narrowed my results from all possible angles? The projects which receive superior ratings achieve very high scores in all four of these categories. Effective presentation of the student's work is also critical. Start early. Plan to work on the project every day and every week; make a schedule for your work and stick to it. When the research is done, and the experiment has been completed, remember that the project must still be presented to a wider audience. Take time in completing the display board first. Then be sure to practice describing your project to your family and friends; listen to their questions to find gaps in your presentation and/or display board and make come corrections. Remember that you know the project the best, and need only share with your audience what you did. On the Science Fair day, dress for success. Along with your display board and materials, be sure to take a table and chair if you need them for displaying your project. Some students also bring a table covering to add color and interest to their display. Remember that a science fair is not a beauty pageant, that simple display boards can be very effective, and that the project will be evaluated more on what you have done and what you have learned. However the creativity of a project will be rated more favorably by judges if time, care, and the effective use of design are obvious. Use lettering for the headings that can be read five feet away. Use one or two colors to attract attention to certain features of your project that are special. Talk to the art teacher for advice on layout . Use a large font size for any written work displayed on the backboard. Type the written paper if possible, and present it as professionally as possible, with a cover and an inviting layout. Make sure the first sentence of your report is very interesting, so that anyone who reads it will want to know more. Then, be sure to take a book with you in case the wait for judges is long. Be on the lookout for the judges, and stand up when they approach you. Introduce yourself, offer to shake hands, look them in the eye, and say firmly to yourself, "I can do this, and my project is really great!" Make your presentation with animation; allow your interest to show! Science fair boards can be purchased or created from plain brown cardboard sheets, lightweight plywood, or pegboard. Most students seem to purchase a board (actually cardboard) from a store or their teacher at school. These are available in colors or white, and have two vertical seams that allow it to stand open on a table. There are size stipulations that must be followed. Sometimes students put a bridge over the top, holding the board open and promoting the project simultaneously. While the display board allows for creative expression and artistic talent, the older the student the more professional the display should be. Avoid clutter. Use at most two or three colors. Label all data tables, charts, graphs, or photographs you use. Artwork, diagrams, and other elements of the display should be your own work. Use of logic and careful planning of the board will result in an attractive display. When students begin a science fair project, they may have some idea of how the experiment will turn out, and they may have some background knowledge. A superior project is one in which the student has done extensive research on the topic, shows evidence of extending him or her self, has used the scientific process carefully and effectively, demonstrates creativity and originality in topic selection, approach, display and expressioby the judges are of critical importance also. Remember that you know your own project better than anyone else and should be able to explain what you did and what you learned and what you plan to do next to anyone who asks! For additional information on the Science Fair Process and Project Ideas please see the following websites. Or go to www.google.com and type in “good topic for science fair projects” “ideas for science fair” “topics for science fair” “tips for science fair” etc. If you are a new student to Acaciawood and couldn’t decide on a topic after doing all the research, I will be happy to give you a topic.